A survey (https://www.linkedin.com/pulse/new-survey-reveals-85-all-jobs-filled-via-networking-lou-adler/) reveals that 85% of all jobs are filled through personal networking. With this article, I would like to introduce to you Networking Business Cards that not only help you build your personal brand, but also, ensure you leave a lasting impression at all your networking events! What are Networking Business Cards? Your networking business card consists of a brief summary of your experience, qualifications, and key achievements. It highlights how you can benefit your potential employer instead of elaborating on your education, work history, and other qualifications. The cards are important for successful networking since they serve as a ‘reference sheet’ that helps your new contacts remember you. Obviously, the next question that would come to your mind is: How are they different from Traditional Business Cards? Your mini résumé (as networking business cards are often called) gives you the opportunity to build your personal brand, whereas, traditional business cards have your employer’s name, job title, and your official contact details, building your employer’s brand! For your personal business card, you can replace your designation and employer’s details with a broad description of your work such as Business Leader, Successful Accounting Professional, Digital Marketing Savant, and others. A follow-up question would be: How is a Mini Résumé different from a Traditional Résumé? Imagine you start chatting with a gentleman sitting next to you in an aircraft, only to realise he is a key member of the senior management team of a reputed MNC. How do you make sure he remembers you? You are definitely going to risk his annoyance or look desperate by handing him a two-page résumé or your contact information on a piece of paper (especially, if he did not ask for it in the first place)! Think of similar situations – introductions by a friend at a party, bumping into an old friend who you have not been in touch with, and other networking opportunities. How do you get the most out of these chance encounters? 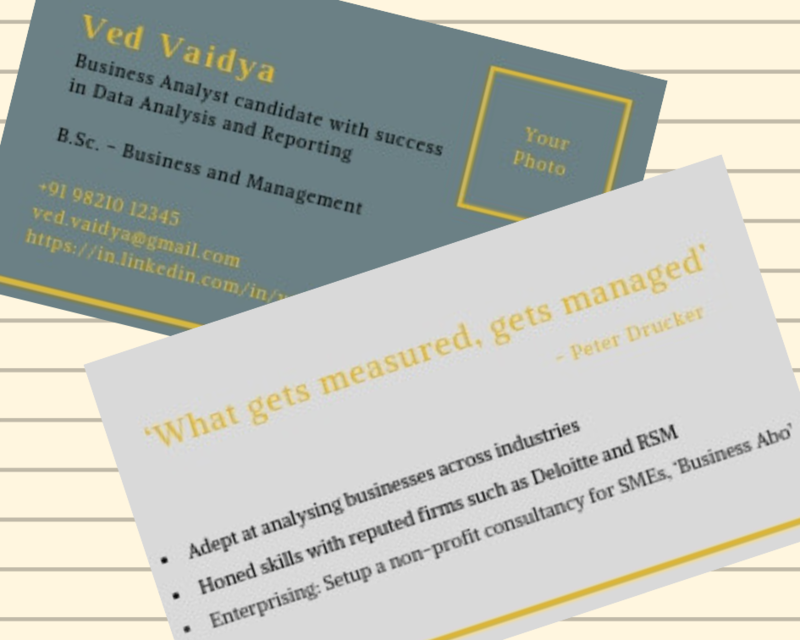 Ofcourse, through networking business cards which are neither bulky/folded like a traditional résumé nor cheesy like details on a piece of paper! What to include on Networking Business Cards? Are Networking Business Cards a gimmick or a Genuine Networking Tool? The first time you hear about these cards they may seem like another new gimmick, especially for people who are looking for a new job. Let me assure you it is not so – networking business cards are an accepted marketing tool globally and for a job hunter so much less intrusive than carrying a résumé. Though your card does not replace your résumé, it provides a convenient ‘capsule’ of information to impress the recruiter/hiring manager. Today, with the advance in technological solutions, we have a lot of opportunities to network online, but, in-person introductions are still the most effective way to network, and networking business cards their currency! You can write to us at [email protected] to know more about these cards. Alternatively, you can visit our website, www.stepitupresumes.com to see a few samples.